The Parish Church of St John was given Minster status, becoming The Minster Church of St John the Baptist on 23 November, 2009. In 1946 a proposal was made to establish a Regimental War Memorial Chapel in Halifax Parish Church. The All Souls Chapel was dedicated as the Regimental Chapel on 22nd September, 1951, to commemorate the 1,406 Officers and men of the ‘Dukes’ who died in the Second World War. There are other war memorials in the Minster including the 49th Division War Memorial to the fallen of the First World War, which was moved from the Drill Hall at Prescott Street to the north east corner of the Church and the Bamboo Cross to the 2nd World War Far East POWs. A number of named commemorative chairs were placed in the Chapel in 1965 and a further 12 were added in 1968. The Minster is home to the Regimental Rolls of Honour Book for the First World War, the Second World War and the Korean War, as well as a number of Stands of Colours laid up at various times from the 33rd and 76th Regiments of Foot, as well as the 1st and 2nd Battalions of the Duke of Wellington’s Regiment. The most notable Colours in the Chapel are the framed Colours carried at the Battle of Waterloo. 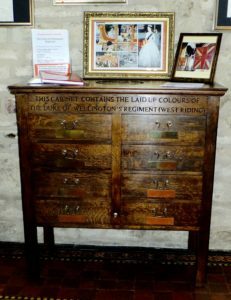 In April, 2008 those Colours too worn to be on display were placed into a specially constructed cabinet, these include the 1761 Stand, 1854 Crimea Stand and most of the Stands since 1925 as well as the majority of the local Territorial and Service Battalions’ Colours from 1909. 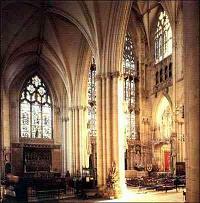 In 2005 the Rolls of Honour held in the Minster were updated with the names of those who were killed in action in Cyprus, Northern Ireland and Bosnia. The Regimental Chapel in York Minster was dedicated on 12th May, 1923, as a memorial to over 8,000 men of The Duke of Wellington’s Regiment (West Riding) who died in the First World War and to those members of the Regiment who lost their lives in previous conflicts in which the Regiment was involved. York Minster also holds the Regimental Roll of Honour Book for the fallen of the First World War, Second World War and the Korean War. A number of Stands of Colours from the 33rd and 76th Regiments have been laid up in the Minster. 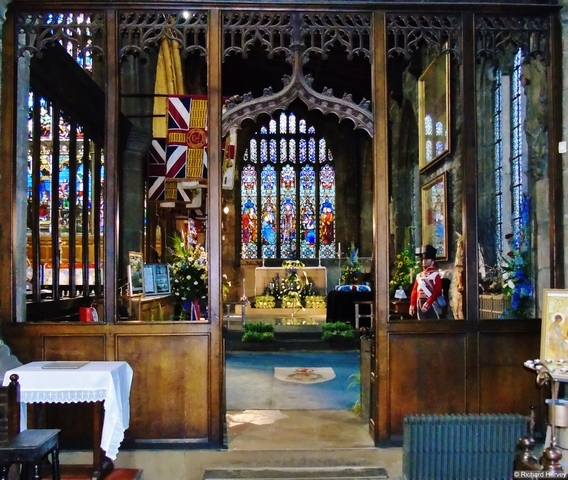 The Huddersfield Parish Church was the principal church for the 5th and 7th Territorial Battalions of the Regiment. All their Colours were laid up in the church. Some of them are now in a cabinet, having become too worn to be on display.